The corruption of Washington's leaders threatens the American way of life, according to a Sept. 14 speech by best-selling legal commentator and former New Jersey judge Andrew Napolitano. “Expose Congress for the weaklings they are and the president for the tyrant he is,” Napolitano told a Leadership Summit on Washington, DC Corruption and the Transparency Crisis several blocks from the Capitol Building. The Fox News commentator and former New Jersey judge drew from his most recent book, Suicide Watch, and two of his WND (World Net Daily) columns, What if Hillary doesn't care? and Will deceptive Hillary get a pass? The conservative watchdog group Judicial Watch sponsored the one-day conference, which primarily documented misconduct allegations against Democrats. 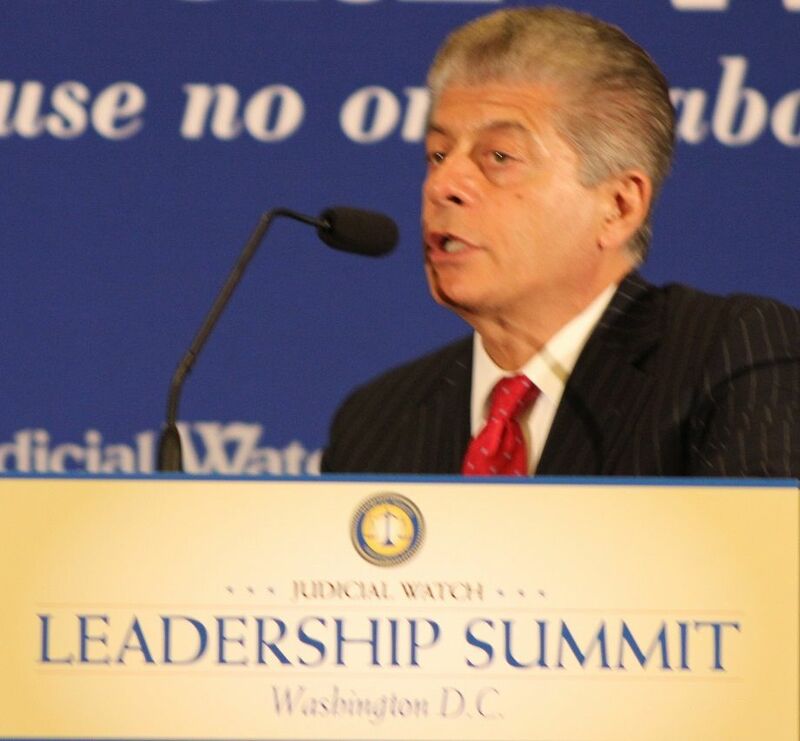 But many speakers like Napolitano, shown in our JIP photo of his luncheon keynote, also condemned Republican leaders for lack of integrity and effectiveness in exposing scandals involving Hillary Clinton, immigration, 9/11, and the Internal Revenue Service. 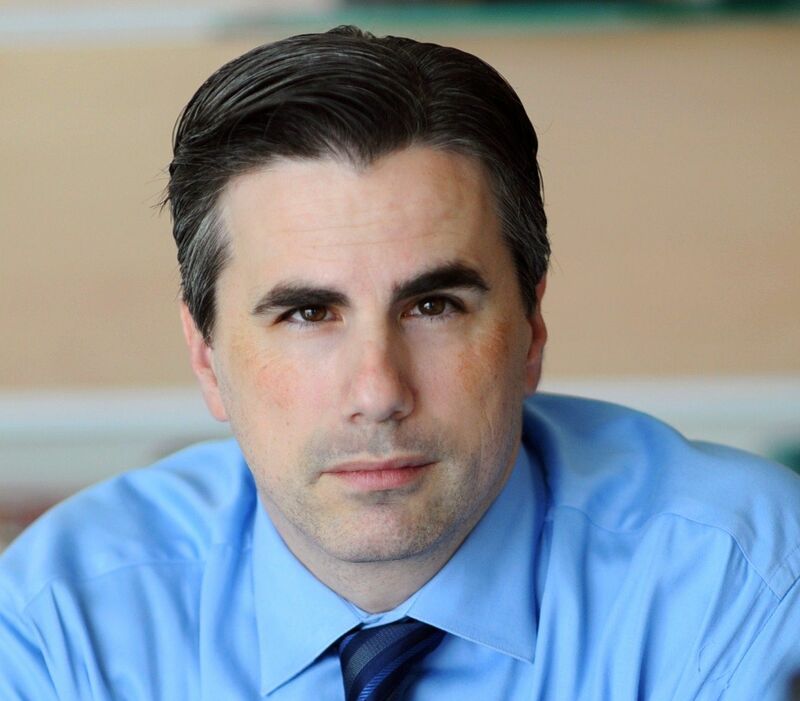 Judicial Watch President Tom Fitton announced that new evidence shows an inexplicable and potentially criminal five-month gap in the official emails submitted recently on behalf of Clinton, the Democratic presidential front-runner and former secretary of state. As for Congress? “If they are doing anything about it, it’s the best-kept secret in Washington,” Fitton announced to an audience of nearly a hundred to begin the day. Republican Joseph diGenova, a former Bush administration U.S. attorney in charge of all federal criminal and civil litigation in the District of Columbia, said he has "never seen an investigation so mishandled" by Congress as its long inquiry over responsibility for the 2012 massacre of four Americans in the Libyan city of Benghazi and related inquiries regarding Clinton’s use of a private email server as secretary of state. Clinton, like several predecessors in the office, used a private system instead of a government-run system whereby communications are more readily reviewed by others. The Justice Integrity Project (JIP) coverage below continues our reporting that began years ago on these issues. Today’s report begins a series on hot-button issues that we have explored at recent conferences, whose topics include money-wasting and otherwise corrupt NSA surveillance of all Americans that failed to stop the deadly 2001 9/11 and anthrax attacks on the United States. Regarding the Clinton emails system, Judicial Watch announced New State Department Documents Reveal Hillary Clinton Email Gap, whereby State Department documents showed a "nearly five-month total gap in the emails former Secretary of State Hillary Clinton decided to return to the State Department late last year." "The documents also show," Judicial Watch said, "that one key State Department official did not want a written record of issues about the Clinton emails. The documents also raise new questions about the accuracy of representations made to Judicial Watch, the courts, Congress, and the public by the Obama administration and Clinton." The documents were produced under court order in a Freedom of Information Act (FOIA) lawsuit Judicial Watch filed on May 6, 2013 (Judicial Watch, Inc. v. U.S. Department of State (No. 1:15-cv-00687)). The lawsuit was filed after the Obama State Department violated federal law and failed to respond to two separate FOIA requests, including a request for records about the actual production of the emails records by Clinton to the State Department. A panel of diGenova and three conservative news commentators -- Breitbart News Executive Chairman Steve Bannon, National Review Online columnist John Fund, and Daily Mail U.S. Political Editor David Martosko -- predicted serious legal and political problems for Clinton and her aides. The speakers also complained about continued reluctance by the mainstream media, congress, and the Obama administration to probe the issues promptly and thoroughly. For a next panel on the "Illegal Immigration Crisis," U.S. Rep. Louie Gohmert (R-TX) and five others denounced what they called a legal breakdown threatening the nation's prosperity and security. "How many of the 9/11 hijackers were [visa] 'overstays'?" Gohmert asked. They criticized especially Obama's instruction to federal subordinates to refrain from deporting many categories of undocumented and otherwise illegal immigrants. "We know him," said National Review Institute Senior Fellow Andrew McCarthy III, "as a chief executive who feels he does not need legislation. He just rules by fiat." Regarding the "IRS Attack on Free Speech" panel, Judicial Watch Litigation Director Paul Orfanedes led three other attorneys in describing the Obama IRS as operating illegally in targeting conservative groups in a tax cases, which in fairness to the IRS. are complicated by the anti-tax and political activist nature of many conservative organizations seeking tax-exempt status to "educate" the public on civic and political issues. Speakers did not address that factor during the conference, just as mitigating factors are usually ignored at most of the conferences that increasingly replace news organizations as sources of news and commentary. Thus, "The tyranny is already here," said former Justice Department litigator Sidney Powell, who spent a decade at the U.S. Justice Department working in Virginia and Texas before becoming an appellate litigator and president of the American Academy of Appellate Lawyers. The author of Licensed To Lie: Exposing Corruption in the Department of Justice said, "We know far too many people who are more interested in keeping their jobs than in doing their jobs." Napolitano's keynote luncheon talk began with historical references to freedom and tyranny. 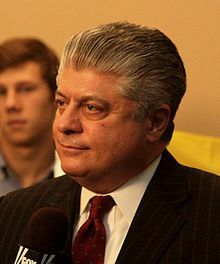 He is the author of eight books and is senior legal analyst for Fox News after being a superior court judge from 1987 to 1995 in New Jersey. In his talk, he proceeded to hard-hitting attacks on Washington corruption, particularly by Democrats, and praise for Judicial Watches hundreds of legal actions seeking disclosure of documents and accountability. Gesturing to the Senate and House buildings a few blocks away from the hotel banquet room, he described lawmakers as "a group of crackpots called the Congress." He drew heavily from two WND columns last month regarding Clinton's actions as secretary of state from 2009 to February 2013, the beginning of Obama's second term. The following comments are drawn from his columns for precision in quotations. "While the scandal surrounding the emails sent and received by Hillary Clinton during her time as U.S. secretary of state continues to grow, Clinton has resorted to laughing it off," he said in Will deceptive Hillary get a pass? "Clinton admits deleting 30,000 government emails from her time in office. She claims they were personal, and that because they were also on a personal server, she was free to destroy them. Yet, federal law defines emails used during the course of one’s work for the federal government as the property of the federal government. Yet Napolitano also has gone into realms that more partisan Republicans dare not travel for fear of undermining prevailing militaristic ideologies. One such area is to discuss and indeed challenge the silence elsewhere about the overthrow of Libya's ruler and then the arms smuggling by the Obama-Clinton administration from Libya's Benghazi to foment revolution against Syria's ruler. JIP reported these developments March 30 in What's Important About Hillary Clinton's Emails, writing "Hillary Clinton’s secret personal email system continued last week to prompt heavy news coverage but with scant scrutiny of the most sinister implications for the public. These involve frightening national security intrigues and political backstabbing." Republicans tend not to mention those matters (which Judicial Watch's litigation helped unearth) because they tend to portray Democrats as more militaristic than their public image. Democrats tend to suppress such discussions because they undermine the image they want to provide of transparency and rule of law. In fact, Clinton and Obama with the cooperation of the intelligence and defense agencies were running a version of Iran-Contra, albeit without the kind of specific congressional prohibition that the Reagan-Bush administration flouted in the 1980s. Napolitano, however, got to the core of it. "What if," Napolitano has asked, "former U.S. Secretary of State Hillary Clinton has been pulling the wool over our eyes for years? What if, while she was secretary of state, she ran two secret wars, one in Libya and one in Syria? What if there already were wars in each of those countries, so she used those wars as covers for her own? What if President Obama gave permission for her to do this? What if the president lacks the legal authority to authorize anyone to fight secret wars? What if she obtained the consent of a dozen members of Congress from both houses and from both political parties? What if those few members of Congress who approved of her wars lacked the legal authority to authorize them?" What if her goal was to overthrow two dictators, one friendly to the U.S. and one not? What if the instruments of her war did not consist of American military troops, but rather State Department intelligence assets and American-made military-grade heavy weapons? What if under federal law the secretary of state and the secretary of treasury are permitted on their own to issue licenses to American arms dealers to sell arms to the governments of foreign countries? What if Clinton secretly authorized the sale of American-made military-grade weapons to the government of Qatar? What if Qatar is a small Middle Eastern country, the government of which is beholden to and largely controlled by the Muslim Brotherhood? What if Clinton just doesn’t care whether she has broken any federal laws, illegally caused the deaths of thousands of innocents and profoundly jeopardized and misled the American people? What if the American people do care about all this? What will they do about it? The Judicial Watch litigation helped expose the Obama-Clinton arms smuggling via its litigation but has not highlighted those discoveries, just as it has not underscored sinister suspicion by Clinton aide Sidney Blumenthal regarding the motives of conservative hero David Petraeus. The group's president, Fitton, instead used his time at the end of the conference to call for action against against secrecy, corruption, and government business as usual and to, as he said, "clean house in government." Justice Integrity Project, GOP Pre-Election Benghazi Plot With Petraeus? Hillary’s Emails, Part II, Andrew Kreig, March 31, 2015. Larger lessons of varying kinds could be drawn from that history. But the one most current and clear is that the Blumenthal email suggests, rightly or wrongly, the possibility of high-level domestic intrigue involving the CIA. Even more important, this ominous threat to democracy was not regarded as newsworthy hardly anywhere except by Madsen, the Washington Times, and perhaps a few others not prominent. More privately, someone of Sidney Blumenthal's acumen thought the threat important enough to source from his political intelligence sources and apprise Secretary of State Hillary Clinton. Justice Integrity Project, Conflict of Interest In Clinton Foundation Funding? Hillary's Email, Part III, Andrew Kreig, April 2, 2015. http://ow.ly/LbpYo The third part of our series on Hillary Clinton's secret email system examines conflicts of interest In Clinton Foundation Funding” is the topic today. The first two parts of the series were: 1) Arms Smuggling: The Obama-Clinton-Petraeus 'Iran-Contra' Scandal; and 2) GOP Pre-Election 2012 Benghazi Plot With Petraeus? Huffington Post, Bill Clinton Blames GOP, Media For Hillary Email Uproar, Daniel Marans, Sept. 26, 2015. Former President Bill Clinton faulted congressional Republicans and a pliant news media for the fallout over Hillary Clinton’s private email server, arguing that the attention given to the emails has been unwarranted. “I have never seen so much expended on so little,” Clinton says in an interview with CNN’s Fareed Zakaria that is scheduled to air Sunday. Republicans have made an issue out of Hillary Clinton’s emails, Bill said, to undermine her presidential candidacy. “The other party doesn't want to run against her,” the former president told Zakaria. “And if they do, they'd like her as mangled up as possible. And they know that if they leak things and say things that that is catnip to the people who get bored talking about what's your position on student loan relief or dealing with the shortage of mental health care or what to do with the epidemic of prescription drugs and heroin out in America, even in small towns in rural America, or how you're going to get jobs into coal country given how much they've lost in the last 20 years.” Bill Clinton compared the Republicans’ efforts to the protracted, partisan investigations he endured as president. “We're seeing history repeat itself,” Clinton said. He noted that the Whitewater investigation, which exhausted $70 million over eight years investigating some of his financial deals in Arkansas, found he had done nothing wrong but allowed Republicans to erode his reputation. 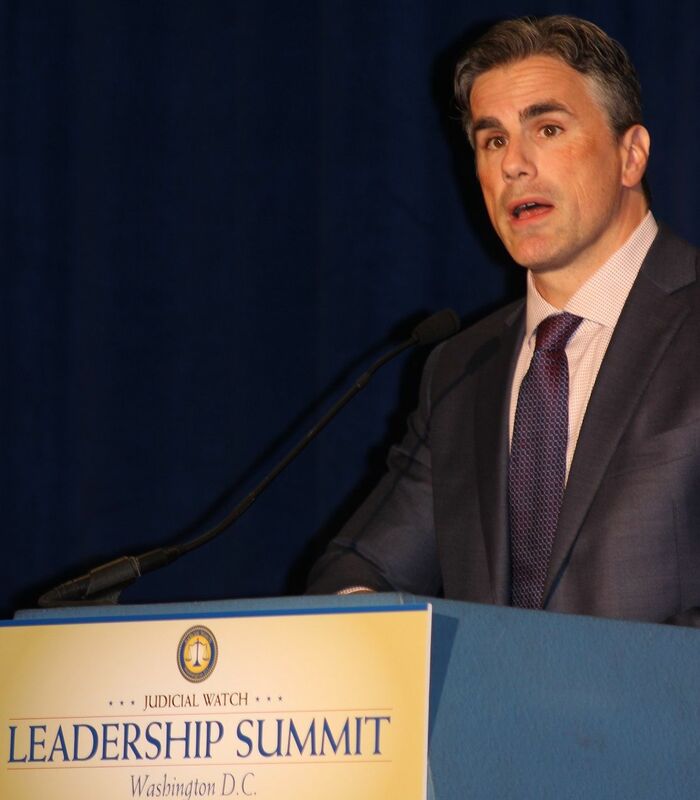 Judicial Watch, New State Department Documents Reveal Hillary Clinton Email Gap, Tom Fitton (shown in file photo), Sept. 14, 2015. Judicial Watch today released newly obtained Department of State documents showing a nearly five-month total gap in the emails former Secretary of State Hillary Clinton decided to return to the State Department late last year. The documents also show that one key State Department official did not want a written record of issues about the Clinton emails. The documents also raise new questions about the accuracy of representations made to Judicial Watch, the courts, Congress, and the public by the Obama administration and Clinton. WND, What if Hillary doesn't care? Andrew Napolitano (shown in a Gage Skidmore photo), Aug. 26, 2015. While the scandal surrounding the emails sent and received by Hillary Clinton during her time as U.S. secretary of state continues to grow, Clinton has resorted to laughing more. WND, Will deceptive Hillary get a pass? Andrew Napolitano, Aug. 19, 2015. Military personnel are indicted routinely for lesser crimes. She could have designated which of the government’s emails were personal and then asked the government to send them to her and delete them from government servers. Instead she did the reverse. She decided which of her emails were governmental and sent them on to the State Department. Under federal law, that is not a determination she may lawfully make. Yet, the 55,000 emails she sent to the feds were printed emails. By doing so, she stole from the government the metadata it owns, which accompanies all digital emails but is missing on the paper copies, and she denied the government the opportunity to trace those emails. When asked why she chose to divert government emails through her own server, Clinton stated she believed it would enable her to carry just one mobile device for both personal and governmental emails. She later admitted she carried four such devices. Then the scandal got more serious, as Clinton’s lawyers revealed that after she deleted the 30,000 emails, and printed the 55,000 she surrendered to the feds, she had the server that carried and stored them professionally wiped clean. Washington Post, State Dept. account of e-mail request differs from Clinton’s, Carol D. Leonnig and Rosalind S. Helderman, Sept. 22, 2015. Officials said their request for records from the former secretary and her predecessors stemmed from their realization that she had exclusively used a private e-mail account. Judicial Watch: San Francisco Crime Surge – Homicide Arrests up 55%, Rapes Arrests up 370% Sept. 10, 2015, Tom Fitton, Sept. 11, 2015. Kathryn Steinle was the 32 year-old woman who was walking with her father on a pier in San Francisco on July 1 just before she was gunned down by an illegal alien criminal knowingly released by San Francisco authorities under that city's sanctuary policies.. We live in a cruel, dangerous world riddled with crime. That's the hard reality. But certainly, elected officials could move decisively if they wanted to against "Sanctuary Cities" and the dangerous criminal aliens who fly under the law. Criminal illegal alien may sound redundant; that's how your government describes illegal aliens who have committed serious offenses on top of their immigration violation. Judicial Watch, 9/11 Comm. Chair “Embarrassed” That U.S. Still Keeps Most Records Secret, Sept. 11, 2015. Fourteen years after 9/11, the U.S. government maintains a robust “stonewall of official secrecy” to hide droves of documents that would likely expose incompetence inside the nation’s intelligence agencies and deceptive relations with foreign governments. A key portion of the information that was withheld by President George W. Bush has been kept hidden by President Obama so this is not a partisan issue, but rather an ongoing effort by the government to keep the truth from the public. The alarming details are provided in a hard-hitting news article published by a nonprofit journalism watchdog, Florida Bulldog, on the 14th anniversary of the worst terrorist attack on U.S. soil. Among the information that long ago should have been made public are 28 blanked-out pages in Congress’s 2002 inquiry into the attacks regarding “foreign support for the hijackers” – read Saudi Arabia. Additionally thousands of significant records that should be available to the public after all these years remain off limits, including information that was provided to the 9/11 Commission for its 585-page report on the attacks that killed thousands. The Justice Department’s assertion of privacy rights for bin Laden is a small rock in the stonewall of official secrecy that continues to hide 9/11 documents held by the FBI, CIA and other government entities on the 14th anniversary of the terrorist attacks. Lately, the public focus has been on the 28 blanked-out pages in Congress’s 2002 Joint Inquiry into the attacks regarding “foreign support for the hijackers” – read Saudi Arabia. The pages, withheld by President George W. Bush and kept hidden by President Obama, have been the subject of recent stories in The New Yorker, The New York Times and others. On Capitol Hill, pending bills in the House and Senate seek to open those pages to the public. Yet hundreds, likely thousands, of significant records about what the 9/11 Commission called “a day of unprecedented shock and suffering in the history of the United States” remain off limits in whole or significant part. The result: an incomplete public understanding of events behind the attacks, and a denial of evidence to 9/11 victims still seeking a measure of justice in the courts. Justice Integrity Project, 9/11 Commission's Forum Shows How DC 'Works,' Andrew Kreig, July 24, 2014. Members of 9/11 Commission this week leveraged the 10th anniversary of their report to announce a dozen recommendations focused primarily on improving the nation's security against terrorists. The former commissioners called for strong spending on counter-terrorism intelligence and more centralized oversight by fewer congressional committees. Speakers minimized divisive issues regarding past mysteries, and presented the proposals as reforms. News coverage reflected that positive interpretation. "Many Americans think that the terrorist threat is waning -- that, as a country, we can begin turning back to other concerns. They are wrong," said the commissioners' new report, which was unveiled during a July 22 forum at the Newseum in downtown Washington, DC organized by the Bipartisan Policy Center. "The threat remains grave and the trend lines in many parts of the world are pointing in the wrong direction." The eloquent, personable and well-credentialed experts from the top ranks of both major parties stressed at the forum and in congressional statements later in the week that the public should fear terrorism and support the recommendations for vigorous counter-terrorism measures.